News just in from Yachtzoo in Monaco of a currency switch and price cut on the 34.53m motor yacht Stella. A Sunseeker Predator 115 built in 2011 to RINA class she has a natural, opulent interior featuring lacquered timber, hardwoods and leather with stone finishes. Accommodation is for 10 guests in a master suite, two double staterooms and two twin cabins while a pair of MTU 16V 2000 M94 engines give Stella a cruising speed of 20 knots and a maximum speed of 25 knots. 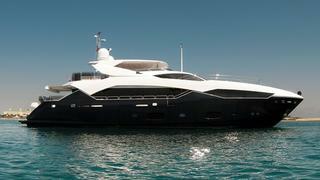 With a builder's warranty valid until July 2013, Stella is down from £8.5 million to €7.5 million.